It has been a while since I have been in a hurricane, or in the path of one. The last time, I was 15 or 16 years old and it was Hurricane Floyd in 1999. Our house was struck by lightening and there was a lil flooding and the power was out for like a week. Thats all I remember. So, this is the first one since then that I will be involved in as an adult. We just had an earthquake earlier this week, which is strange too. The update so far is that by the time Irene hits Virginia Beach, it will be down to a category 1. We are not evacuating, although Sandbridge was evacuating, which is a few miles away from us. We got 4 cases of water, tons of food, gas in our tanks, everything tied down, and candles. This is a picture a few days ago...I hope Irene keeps this park in good condition! My husband works at the Target down by the Oceanfront, and everything got wiped out: water, flashlights, batteries, coolers, candles(tealights) and whatever else needed for hurricane supplies. In fact, I had to go to a few stores to look for tealight candles, until I remembered that Micheals Craft Store will have them! and I was right! I found a 100 count box of tealights for only $5! so I grabbed 2 boxes and went on my way. I love Micheals, and what was cool is that it was not crowded at all, it was like my secret hiding place where only I could get them!!! well, and my aunt too, because I called her and told her to get them too! 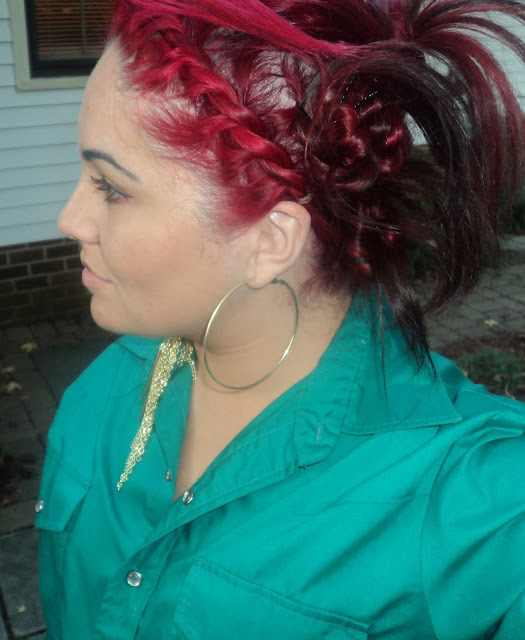 I never got a chance to post that I did my whole head RED (well, actually its Vampire Red, from Hot Topic) and a cute lil updo I did! The kids went with me while I ran last minute errands, plus they wanted Cookie Crisp cereal, which sounded really good! Oh, and cool thing that happened to me today was that another blog I followed gave me a lil shoutout! He makes the most unique custom shoes ever and I stumbled upon his blog sometimes last year, I dont even know how or when, but since then I draw inspiration from him and his site. I like to be in contact with other artists, it helps to get my creative juices flowing! So, thanks Elom! Well, Just in case anyone keeps tabs on my blog, I may be absent for a few days due to Hurricane Irene. I will prolly do another post later tonight. Thanks for stopping by, subscribe or comment if you would like to leave any feedback! Taking chances is one of the hardest aspects of life not only to understand, but may also be difficult to actually use effectively as well. Taking a chance is leaving a safety net and stepping out into the unknown. Sometimes the unknown is better than where you were before, and sometimes it simply isn't. Taking chances though is absolutely necessary to advancing in life. Without doing so we would never make our lives better than before, our lives would simply be at a stand still. 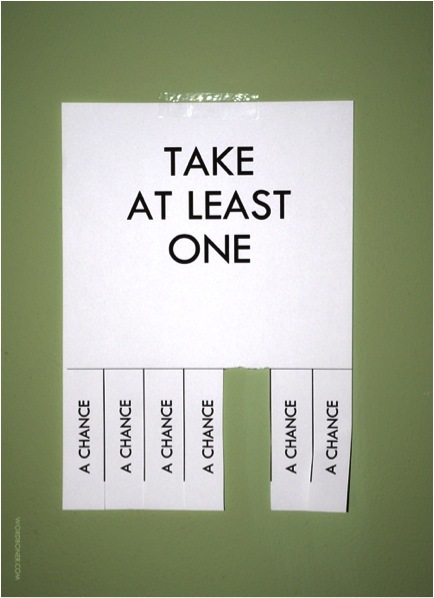 There are many ways that you can take chances throughout your day in order to change. From accepting a new job, or to buying a different kind of soft drink at the gas station, the smallest decisions to the biggest decisions change our lives everyday directly and indirectly. Make sure that your life is full of taking chances and calculated risks, in order to maximize growth and success.